Conflict of interest is an understatement. Those that say there’s nothing wrong with GMO’s need to see this image. 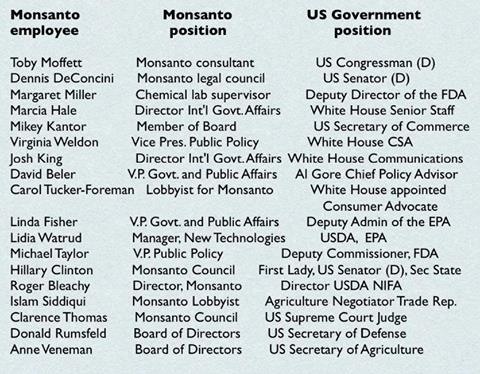 The revolving door policies of the United States Government are clearly evident. When agribusiness giant, Monsanto needs a new product approved or laws loosened to suit their needs in order to force their products on farmers and tighten their grip on the seed monopoly they simply line the pockets of men and women whom have sold their moral compass. When these sort of business tactics are used to pursue a certain agenda one has to realise that the products being pushed on to us, the public, can’t be good for the environment or our health. It’s time to wake up and spread the word about this corporation and their agenda to own the patents on all seeds in order to control the global food supply.